Many people prefer to hibernate in the winter months. I know that it is harder for me to get up to exercise this time of year. The days are shorter, and boy is it cold here in the Northeast! Who wants to get out and exercise? Let’s talk about the reasons why you should exercise in the winter, and some tips for adjusting your exercise routine to the cold weather. Why should you exercise in the winter? Sunlight is your friend during the winter months – Exposure to sunlight is beneficial in many ways this time of year. It helps to provide your body with vitamin D, which often becomes low in the winter months. This helps you maintain strong bones, and good immune function. Vitamin D also helps you maintain energy and helps to ward off muscle aches and pains. Sunlight also helps to improve your mood as we discussed in our recent Health Tip about seasonal affective disorder. Exercise keeps you warm – There is a rise in your body temperature during a workout, which actually has a soothing, calming effect on your body. It actually makes you feel warmer than using a heater, because it is warming you from the inside. You may be cold when you first step outside, but if you dress correctly, you will be warm within no time after you start exercising. Avoid the cold and flu – Research has shown that regular exercise improves your immune function. A healthier immune system is better able to fight off those cold and flu viruses that are so prevalent this time of year. Fresh air is healthier – The air inside our homes, especially in the winter when all of the windows are closed up, is not nearly as healthy for us as the air outside. When you are exercising outdoors, you get to breathe deeply without the worry of breathing in a virus from your coworker! Avoid that winter weight gain – Exercising in the cold burns more calories than in the warmer weather. It just takes more calories to heat up your body. It is easy to gain weight in the winter for many reasons. Take any opportunity to burn calories. How should you adjust your routine for exercising in the cold weather? Check the weather conditions and forecast before heading out. Even people who are used to exercising in the cold should not be out when the temperature is too low. If the air temperature is below 5 degrees F, or if there is a significant wind chill, exercise inside. If it is raining or snowing, remember that being wet really makes you more vulnerable to the cold. Exercise indoors or put off your workout until after the precipitation has stopped. Dress appropriately – Wear layers of clothing so that you can be warm enough when you start, and peel off layers as you get warm, then put layers back on as you get to your cool down. The layers, especially those closest to your skin, should be made of fabric that wicks moisture away from your skin. Fabrics that hold moisture against your skin, such as cotton, make it nearly impossible to stay warm in the cold weather. Don’t forget your gloves and be sure to cover your ears and head. If you are shivering during your workout, you are not working hard enough or more likely you are under-dressed! Warm up inside before you go out into the cold. Take 5 or 10 minutes to do some jogging in place or maybe some jumping jacks or other aerobic activity. If you have asthma, or other medical problems that can be worsened in the cold, be sure to check with your doctor before exercising outdoors in the winter. Watch out for icy or slippery patches on the street or sidewalk. Since the days are shorter, you may not get home from work before sundown. Remember to wear light colored or reflective clothing if exercising when it is dark outside. 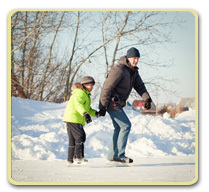 With a few extra steps to stay safe, you can enjoy winter exercise. If you have any questions about winter exercise, please log into your account and send us your question. We are here to help.